The third revival of the Sproat Lake Regatta is happening this weekend with a Show N' Shine kicking off the weekend on Friday. 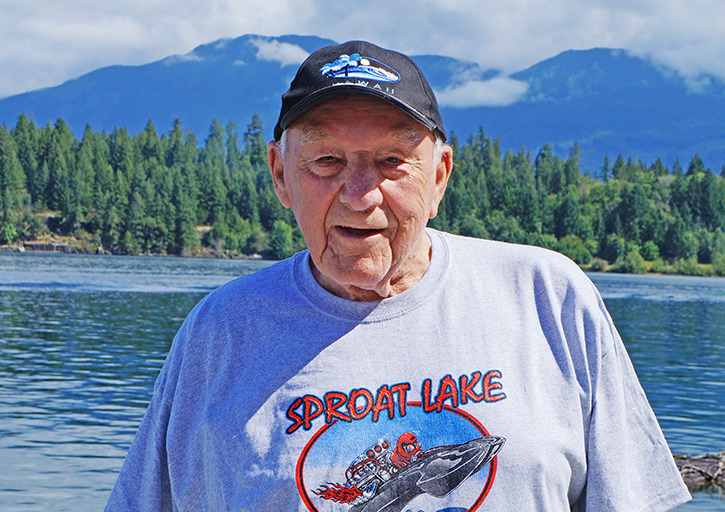 Sproat Lake will be busy with boats of all sorts competing for the fastest speeds during the third year of revival for the Sproat Lake Regatta happening July 15–17. The boat races were extremely popular during their decade taking place on Sproat Lake from 1953 to 1963 and would attract upwards of 5,000 spectators and 200 racers. “It’s gradually building up again but it takes time,” said Joe Van Bergen, a founder of the original regatta. This year, Van Bergen and members of the Alberni Valley Regatta Association (AVRA) predict to see around 50 racers and anywhere from 500 to 1,000 spectators on Sproat Lake. Van Bergen, who still holds a Canadian speed boating record at 90 years old from 1963, said in the 1960’s the original regatta eventually ceased because there just weren’t enough volunteers to sustain the rigorous planning and organizing of the event. “Now we’ve got about 25 volunteers but we could sure use more, there’s a lot of work to do,” Van Bergen said. It was a group of boat enthusiasts from the AVRA that came together to plan the regatta revival because they wanted to see racing back on Sproat Lake. “Basically I do it for these guys [AVRA] and I do it for the Valley because it’s such a fantastic event… and every year we’re hoping to be bigger and better and get that wow factor,” Greg Steel, AVRA president said. The races are a quarter mile long and take place off the shoreline of Sproat Lake Provincial Park, where spectators can lounge and watch the events. “The course gets set up on the shallowest part of the lake so if anything unfortunate happens the boats can be recovered,” Steel said. The sport is fast, but it’s safe, says the regatta’s safety coordinator, Dave Coombs. “We’ve got divers and first aid and a big first aid trailer…in the last years there’s been no incidents,” Coombs said. A log boom floating near the races will be set up selling water and regatta t-shirts which saw close to $700 in sales during last year’s races. A portion of the regatta’s proceeds raised through merchandise and advertisement sales are put towards community organizations. “Last year we gave some bursaries to the mechanics course at North Island College, we gave $1,000 to the Sproat Lake Marine Patrol and we put in $500 for the community association to make a parking lot,” Van Bergen said. The weekend kicks off with a boat and classic car show and shine on Friday at the Blue Marlin Inn from 3-8 p.m. Rick Herbert, coordinator for the show n shine, said many of the boats on display will also be racing in the weekend’s regatta. Boat races take place on both Saturday and Sunday beginning at 10 a.m. Admission is free. The best spots to watch are around the Sproat Lake Provincial Park. Boats will launch from the boat launch, and ‘pit area’ will be set up on the beach closest to the boat launch.